When referring to LBA change, then we must talk about defect lists. We know that hard disk' data storage is with high density, so it is inevitable to make some defect sectors during its production process. What's more, those unstable sectors will gradually aging and will cause data read & write error, then they will turn into defect sectors. These defects and unstable sectors will seriously threaten hard drive's data security. And in order to protect the data, hard disk manufactures have designed P-list and G-list to deal with those defect sectors, and these two defect lists will be used to record statuses of defect sectors. P-list is also known as permanent defect list, it is used to record the defects generated during production. After a defect sector is being added to P-list, disk will no longer read or write this sector, but to read and write the next following sector. 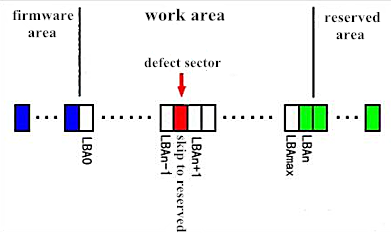 This operation will change LBA values of all the following sectors, and one sector from reserved area will become LBAmax of the disk. That is to say, if the change of a defect list can lead to the change of LBA value, then ECC value will also be changed, thus resulting in UNC error. This is why when defect list of one Seagate disk is broken will lead to translator disorder, which will result in a situation that scanning can normally read out the data from sector 0 to a specific sector, but from that specific sector to the end, all the sectors are unable to get the data with errors of ERR and UNC. Combining with the above two pics and illustrative pics of P-list and G-list, we can find that the so called "dig" list actually means from the next following sector of the "dug" sector, all subsequent sectors will change their LBA value. While "replace" list means an available sector will be used to replace the defect sector, and all subsequent sectors of the defect sector wont change their LBA value. Generally if it is a first hand disk, then reason 1 owns first priority; if it is a second hand disk, then reason 2 or reason 3 owns more possibilities. The above all are the contents of analysis on "sector access interruption" of Seagate drives, thanks for your reading.